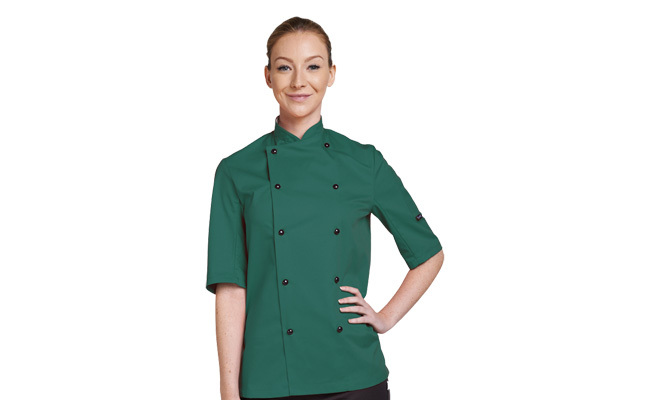 These ultra-smart short sleeve chef jackets come in a variety of sizes and colours with non-removable black capped studs. Made from hard wearing polyester/cotton perfect for home laundry with drip dry and minimum iron properties. These bright short sleeve chef jackets are lightweight with short sleeves to keep you cool in the kitchen. These unisex chef jackets are low cost and a best buy with professionals. For a contemporary and stylish look that is practical and quick to take on and off. Whether you are looking for a purple chefs jacket or a grey chefs jacket, there are a variety of inviting colours to choose from. We stock a complete range of chef clothing so take a look at our other chefwear like chef trousers and chef hats. If you have any questions about our chef clothing range or a general question about any of Pattersons Catering Supplies, call 0117 934 1270.